Gorgeous fresh flowers including orange alstroemeria, cheery sunflowers and stunning orange roses are delicately gathered in a traditional milk jar vase, accompanied by an assortment of gourmet goodies. 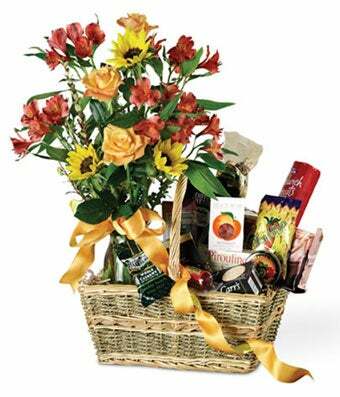 Fresh nuts, tasty fruit candies, delicious cheese spread, pretzels, flavored popcorn, sausage and more are all expertly arranged beside the flowers in a decorative handled basket, creating the ultimate presentation for any occasion. Measures approximately 27"H x 17"W x 14"D.